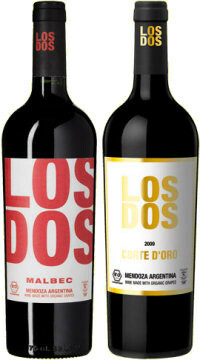 Los Dos was a new name for me when these two sample bottles landed on my desk. The wines, a 2009 Malbec and 2009 blend of Malbec and Cabernet Sauvignon called Corte d’Oro are made from 100% organic grapes, grown at 1,100 metres altitude in Agrelo Alto, Mendoza. The ‘dos’ are the partners in the project: the vineyards belong to Swiss artist Dieter Meier, and the Tuetonic connection is completed by partner Laurenz Moser of the Lenz Moser winery in Austria. The wines are not yet available in the UK, but see European merchants offering worldwide delivery on wine-searcher. Finished with “a touch of French and American oak'” this has a pleasing violet edge to the almost black colour, and a delightful floral edge to the aromatics too. There’s plenty of blue/black, ripe berry fruit, but it has spice, that almost jasmine-like fleeting moment of perfume and a suggestion of juiciness. On the palate this brims with black fruit, berries and plum, with a sweet edge and then a touch of liquorice into the finish. Not hugely complex in the end, perhaps a touch hot too, but spicy, powerful yet still agile. 88/100. This one is aged in French oak, around 50% of it new. It has a most attractive nose, the pencil-shaving and cedar finesse allied to deep-set, blackcurrant fruit, and though the floral edge is less pronounced, it has some life and crunch about it. On the palate there is plenty of sweet fruit; it’s a plush wine that floods the mouth, the oak perhaps just a touch strident, adding a little resinous touch. In the finish there’s real juiciness to the fruit and tannins, spice and good balance, though perhaps the oak could be held back just a little. 89/100.